Would You "Hang Out" With Jesus? The Christmas Feasts are over and we return for a while (until Lent) to ordinary time, the ordered cycle of Sundays which call us to reflect on the many dimensions of our following of Jesus. Fittingly enough we begin at the beginning of Jesus ministry. He has been baptized in the Jordan and now He sets about calling his first disciples, Andrew and Simon Peter. This year we have the version of that call given to us by John. (John 1:35-42) In the synoptic Gospels Jesus calls them to leave their nets and follow Him. John gives us another dimension of this call. 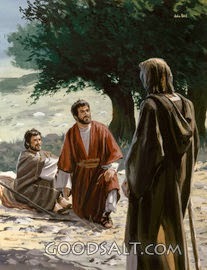 In John, Andrew and another disciple overhear John the Baptist's "Behold the Lamb of God" statement and followed Jesus. Jesus asks what they are looking for. They ask Him, "Where are you staying?" Jesus' answer is "Come, and you will see." We are then told that they spent a day with Jesus. What a day that must have been! What are we to make of this invitation? What does it say to us as disciples of Jesus today? Matthew, Mark and Luke in presenting Jesus asking the disciples to drop their nets and follow him remind us that we too, as His followers, must drop our nets, not literally giving up job, family, etc, but making the following of Jesus our top priority. John's version challenges us in another way. It asks us if we are willing to accept the invitation to go and live with Jesus, to go away from our own comfort zone and live with the Lord. I believe that Pope Francis who continually calls us to live the Gospel is, in his preaching, extending both of these invitations to us--to drop our nets, and to go and see where Jesus lives. That is why he de-emphasizes rules and doctrines. It is not that rules and doctrines are not important, but rather that without prioritizing our relationship with Jesus as the starting point of our Christian life the rules and doctrines become mere empty words. Our evangelical brothers an sisters often talk about having a personal relationship with Jesus. We would do well to listen to them. The challenge for them and for us is asking the question that Andrew asked Jesus, "Where do You live Lord?" As Catholics we believe that He lives especially in the Eucharist. Together with our Protestant friends we believe the He lives in His Word. But all of us are challenged to encounter Him in another way, the way which Pope Francis points out, --In the Poor. This means not only the materially poor, but all those who are marginalized in many ways. These three dimensions of the Lord's presence we might see as three rooms in the Lord's house. I don't think that the Lord wants us to stay in one room, but to encounter Him in all three that we might delight in the fullness of His presence. So let's "hang out" with the Lord, to use a modern expression. Let us be nourished by Him in the Eucharist. Let us be filled with His life as we encounter Him in the Scriptures. Let us finally go and meet him in the highways and byways of the world in the poor and forgotten. I have found that I need to meet the Lord in all of these ways and am most blessed when I do. The title of this post might suggest that I want to look back at the decade of the 1960's. Not so, though that decade was a significant one in my life since I graduated from high school, entered the Franciscans, took my vows as a Franciscan and wrestled with my place in my Church and my country in a good way. The 60's I speak of here are the years that span from 2004-2014, the decade in which I passed from 60-70 years old. Many things happened in my world during this time. Boston sports teams enjoyed incredible success. Three different popes lead the Church and 2 presidents the country. Terrorism and tragedy continually hit the news. But I do not write of these things either. I write of what happened in my own personal life because these ten years have been a time of grace and blessing. They were not easy years, far from it, but the graces and blessings came precisely from the challenges. 1. In 2005 I went through Hurricane Wilma in Miami.he was a category 3, but hardly noticed nationally because Katrina took place that year. 2. In 2006 I was diagnosed with prostate cancer and began treatments which ended in 2007. I also learned that I was a type II diabetic. 2a. In 2007 my car was hit by a "flying refrigerator." 3. In 2006 I moved to St. Anthony Friary in St. Petersburg which is still my home. 4. In 2006 I was united with a sister, Dorothy, that i hadn't known before. 5. In 2011 I celebrated 40 years as a priest. 6. In 2013 my book, The Wandering Friar, was published. 7. 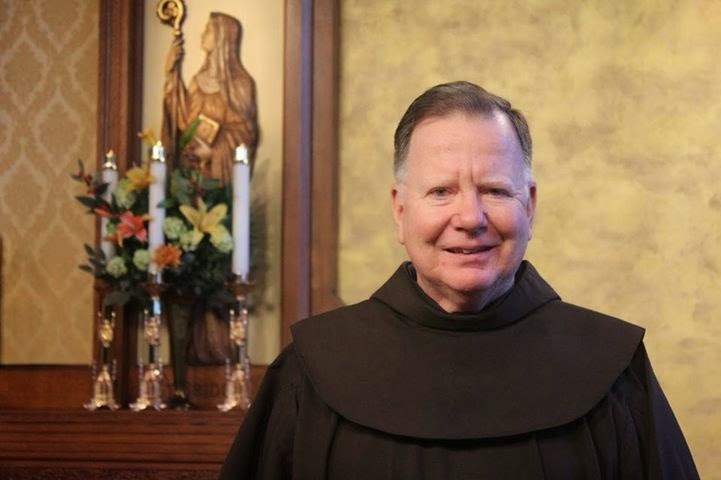 In 2014 I celebrated 50 years as a Franciscan. 8. In 2014 I turned 70 years old. This string of events has lead me to a new place in my life, a place in which I rejoice and am at peace, a place that I like to call "the stretch run." I choose this term because it does not suggest by any means that I am finished. After all it is still a run and not a crawl. I am about to publish another book and I have preaching commitments lasting into 2018. At the same time, living here at St. Anthony Friary which is basically a place for retirement for us friars, though I am not yet a member of that population, I know that most of my active years are behind me and that diminishment and a meeting with what we friars call Sister Death, is not terribly far away either. To comment briefly on the above mentioned events the experience of the storm, illness and the refrigerator taught me that life is a precious gift, that the Lord can call me (us) home at anytime, so make the most of each day, each moment that the Lord grants me. The refrigerator story adds a bit of humor to the situation, though it reinforces the message. You see, in the summer of 2007 after happily returning to my summer ministry in Eagle River, WI after having gone through cancer treatments I was driving down the road one day and a used refrigerator loosely fastened to a truck fell and side-swiped me. I said to the Lord, "Really, You didn't get me through cancer to call me home with a flying refrigerator." In the midst of all of the above I discovered that I had a sister that I hadn't know before. Getting to know Dorothy has been a blessing, has added richness to my life and show me that life always offers surprises, in this case a wonderful surprise. I already mentioned living here in our friary. Many of the men here are still quite active but others are in various stages of illnesses that will lead them home to God. It is a humbling reminder of what lies ahead for me, yet these men witness to a faith and a bravery that I hope I have when the time comes. The book and its writing have helped me to realize how blessed I have been throughout my life as a friar and as a priest and even before that by growing up in a wonderful Catholic family and neighborhood. The anniversaries celebrated do the same. The book also helps me realize that I am a late bloomer (not that the early years were bad) because in my later years my ministry and my vocation have born the greatest fruit. Who knows? Even grater things may lie ahead. 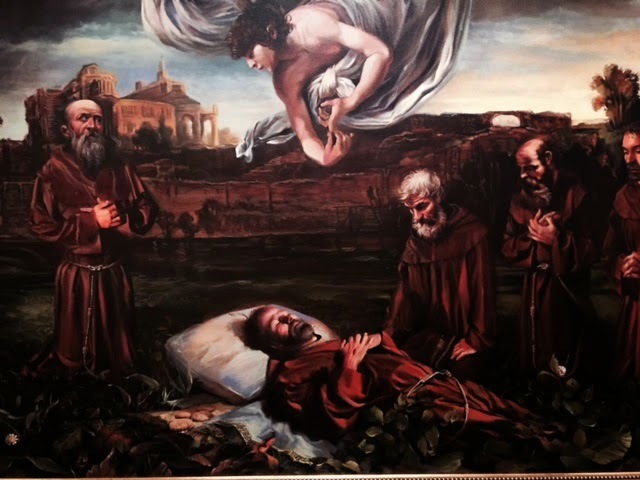 Finally I sit in our chapel every day and look up at a wonderful painting of the death of St. Francis where he is surrounded by his fellow friars. The thoughts I have are not morbid ones, but grateful ones, because I know that in the years ahead, whatever else may happen, I will by accompanied to meet Sister Death by my brothers. Francis meets Sister Death--St. Anthony Friary Chapel.